This page is the responsibility of Dr. James Hayes-Bohanan. Only one member of Congress has served his country in Iraq -- Patrick Murphy of Pennsylvania. Guess what -- he says that both Republicans and Democrats have failed. He says: "Stop this madness." to be paid over decades. "[As] a matter of constitutional fact ... the Democrats could stop the war if they chose. They choose not to." I wish the war was over. I wish the war never existed. Our national geographic illiteracy is a threat to our national security. How do you ask a man to be the last man to die for a mistake? Of course, Kerry and a lot of other wimpo-crats voted for this war anyway. I don't know if I want White America to remember or fortoget, that Jesus Christ was the first non-violent revolutionary. A popular bumper sticker during the Clinton presidency; it is due for a comeback! Here in America we are descended in blood and in spirit from revolutionist and rebel men and women who dare to disssent from accepted doctrine. As their heirs, may we never confuse honest dissent with disloyal subversion. Wars are all about chaos and catastrophes, death and suffering, and lifelong grief, which is why you should go to war only when it's absolutely unavoidable. Wars tear families apart as surely as they tear apart the flesh of those killed and wounded. Since we learned nothing from Vietnam, we are doomed to repeat its agony. [Secretary of State] Powell said of the tsunami, "The power of the wave to destroy bridges, to destroy factories, to destroy homes, to destroy crops, to destroy everything in its path is amazing." He said, "I have never seen anything like it in my experience." Yes, he has. 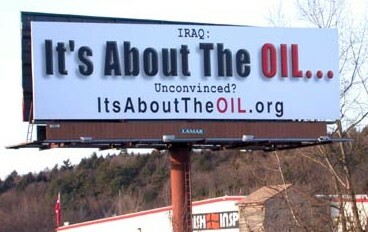 It was in Iraq. The tsunami was us. Peace starts with understanding. See Pax Mundo for ideas. Is freedom becoming UnAmerican? Ian Rhett thinks so. Blood shed in Iraq does not honor the memories of the heroes of September 11, nor will it reduce the likelihood of future attacks. In fact, it seems to be having the opposite effect. The liberation of Iraq is a welcome outcome, but the pretexts for the war were false and the costs of the war in human lives has been too great. "Pre-emptive self-defense " is a new doctrine of warfare that sets an incredibly dangerous precedent. Good news: Saddam captured. Bad news: We should have captured him when he was our client. More bad news: We had him executed in a manner that energized our enemies and alienated our friends, such as the Kurds who wanted him to stand trial on atrocities committed against them. Such a trial would have revealed more of Saddam's evil deeds, but it would also have demonstrated how bogus are the claims that the U.S. government cares much about such things. 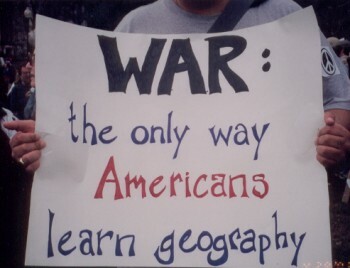 I gave a talk about international perspectives on the war at a rally held at Bridgewater State College on April 28, 2003. My opposition to the war is also described in a pre-war letter to my local newspaper. Would you know a fascist society if you saw one? Read this list of 14 fascist characteristics to find out. Also see David Loehr's excellent article, "The Fundamentalist Agenda," for an explanation of the connections among fundamentalism, fascim, and terrorism. It really gives me no pleasure to say "I told you so," but I am glad that many people are beginning to recognize that war on Iraq was a mistake. Look back at Josh Frank's list of ten reasons not to attack , which he wrote in January, 2003. Some of his reasons seemed radical at the time, but events have proven him right on most counts. 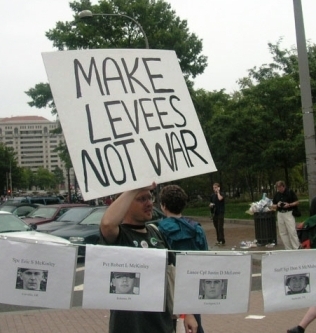 See my Energy Conservation Education page for ways that we might avoid the next war. Sure Saddam was awful, but how many lives are we willing to trade for him? Thousands more soldiers have been permanently disabled, and at least 100,000 may require mental health care when they return. "There should be a law, I thought. If you support a war, if you think it's worth the price, that's fine, but you have to put your own life on the line. You have to head for the front and hook up with an infantry unit and help spill the blood. And you have to bring your wife, your kids, or your lover. A law, I thought." The minute any member of the Bush family -- between court dates for drunk and disorderly charges -- reports up for combat duty, I'll take down this web site. Please see the "Bush Haters" note below for some clarifications. I understand the controversy about the mosaic above. Some of the service members included would probably not have agreed with the implications of this image; others would. For me, it is the strongest possible reminder of the cost of one very poor decision, made on our behalf but not with our consent. 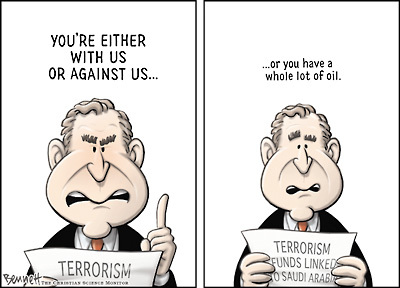 Bush says "Bring 'em on!" but military families say, "Bring them home." Find out what Veterans for Peace have to say about this misplaced war. Of the 537 elected officials in Washington (House, Senate, President, and Vice President), only three have sons or daughters in the armed forces. Nobody in the president's inner circle was ever combat, and both the president and vice president actively avoided serving in a war they supported. Be sure to read my " Support the Troops" section below, and read about Sue Sepir Niederer . If you think soldiers are "dying to protect our freedoms," find out what happened to this mother of a dead soldier. A group of 80 intellectuals recently signed a statement in support of peace and justice, which appeared in Z Magazine. Since then, more than 110,000 people from throughout the world -- including me -- have added their name. I invite you to read the statement and consider adding your own name. A friend took the photo at right during a protest in Boston. Sadly, it seems to be true for many Americans. At the outbreak of the Vietnam War, only 14 people in this country spoke Vietnamese. As the conflict wore on, the Brockton Enterprise printed an editorial praising the bravery of soldiers willing to go fight in a country most Americans cannot find on a map. I agree they are brave, but ignorance of geography is no virtue in this increasingly complex world! Because I believe that the best antidote to ignorance is understanding, I have launched a new web site: Pax Mundo , that helps U.S. citizens overcome the geography gap. See the July 27 Doonesbury if you wonder about the news you have been hearing. See BSC Library's War with Iraq page or the list of links below for some choices. If you really want to show support, consider donating Hero Miles. If you do not have frequent-flyer miles to contribute, check some of the other links on this site for other opportunities. For example, I was able to donate airline vouchers to a military dependent in need through Fisher House. By giving just $800 in vouchers, I "sacrificed" more than the Commander-in-Chief has. Copyright 2004 Rob Rogers Permission pending. Quite a few of my students -- including some of those to whom I am closest -- are soldiers or reservists. Others are veterans or military dependents. One of my best friends is a Vietnam veteran who has shared with me some of the hurt he experienced on returning, particularly in the liberal religious denomination to which we both belong. At the onset of the Iraq war, the rallying cry to "support our troops" caused me to think long and hard about what it means to be against this war but to continue to respect and even admire the military people I know. It seems to me that the wrong -- though most common -- approach was simply to fall in line behind the president and his mission, out of solidarity with the troops he sent over. Because my relationships and friendships with these people started before the war and will continue after it, I do not see how my support for the troops is dependent upon my support for the mission. For if it were, then my support for the troops would require me to support any and all future missions that any future president might initiate. If support for troops equals support for the adventures of presidents, then we have a monarchy, or worse. Clearly, then, this could not be the answer. Another common response from the left was, "Support our troops: Bring them home." I had some sympathy with this position, and certainly people on all sides of the debate were hoping to see the troops return safely and soon. It was too facile, though. I heard a soldier on a radio program reject this notion, and it occurred to me that we cannot equate support the troops with rejecting a policy that many of them endorsed. One thing that is certain: supporting the troops and remaining silent on the war are not the same thing. It has become a cliche to say that we have the right to speak against the war because our soldiers are sacrificing to defend that right. This begs the question of whether the current mission is achieving the stated objectives. I do not happen to think that the current mission has anything to do with defending free speech. Given the proclivities of those running this war, I rather think that the opposite is true. That is, free speech must be exercised despite the waging of this war. A reservist I know and admire -- and who has willingly been activated in the past -- would have joined this conflict had she been called, but she took her next opportunity not to re-enlist, because of her misgivings about Iraq and her fears about what other adventures might be added. A few weeks prior to the war, a former student and veteran of the first Gulf War contacted me by e-mail to find out whether I could help him find a protest to join. One of the few protests I actually attended was also attended by a mother who had a son in Iraq. She supports her son, but she did not support the mission he was on. I have come to conclude that support for the troops and support for the war are two different things . People on both sides of the question of whether this war was justified can have respect and good will toward the troops involved. This support and good will does not necessarily lead to either position. One argument I have heard in support of the war is that U.S. troops have the best training and intentions to ensure minimal suffering among civilians and even among enemy combatants. It is acceptable for the U.S. to wage war, it seems, because it does so more humanely than do other countries. This argument makes little sense, but I present it here because I have heard it several times and because it attempts to translate respect for our military into a reason to support the war. I accept the contention that the U.S. military tries harder than any other to minimize civilian casualties, and even to provide for humanitarian relief after the conflict. I would argue that this is true not only because of the virtues of our individual soldiers but also because of pressure exerted on the military following past debacles and even some civilian massacres. The gains made by critics of the Pentagon are not sufficient now to silence those critics. The other difficulty with this line of argument is that even the most careful of attacks has already resulted in many thousands of civilian deaths in Iraq, with over 2,500 allied deaths and untold Iraqi combatants killed. These numbers do not reflect badly on our soldiers; they are the responsibility of the president and of the Congress, and ultimately of the electorate. If we ignore this responsibility in the name of "support" for our troops, we have walked away from our responsibilities as citizens. Finally, I have difficulty accepting the premise that those who oppose the war are hurting the troops more than the president who has sent them into harm's way. I also bear in mind that during a previous war of questionable merit, this president used his status as a "senator's son" to dodge participation. When Gen. Clark and Michael Moore brought up this issue, they were rebuked, but the rest of the media are now starting to understand the problem. See Moore's February 11, 2004 letter to President Bush for an explanation of the charges. Remember that during the Clinton Administration, a lot of his opponents had bumper stickers that read, "Draft Dodger for Commander in Chief? " I have not seen one of those since January 2001, and would happily put one on my car today! I think that the perspectives of the soldiers, sailors, and marines are very important -- and each has his or her own story and opinions. Blake Miller became famous through this photo by L.A. Times photographer Luis Sinco. His story is told in a thoughtful article by Jim Warren, "Former Marine is 'Marlboro Man' No More." November 2007 update: Mr. Sinco continued his contact with Cpl. Miller, trying to save him from post-traumatic stress syndrome. He wrote "Two lives blurred together by a photo" for the L.A. Times, and was interviewed by Robin Young on WBUR. For further thoughts about support for our troops in these troubling times, see the comments of Rev. William Sinkford, the president of the Unitarian Universalist Association. Critics of this war are often dismissed as Bush Haters, as if we only complained because we had some personal dislike for the man. In my case, I had no disdain for him prior to 2000 -- he has worked hard to earn my disrespect. When I lived in Texas, he was my governor. I did not vote for him, but I did not panic when he was elected. During the 2000 campaign, I considered him and Al Gore almost interchangeable, because they were in many ways. I did not vote for either one of them, but I did not hate either one of them either. I still do not hate either one of them, but I really began to lose respect for President Bush when his team -- led by Katherine Harris and Karl Rove -- stole the election. Since then, a slim "mandate" has been used to leverage a series of radical domestic and foreign policies that are highly dangerous and offensive. 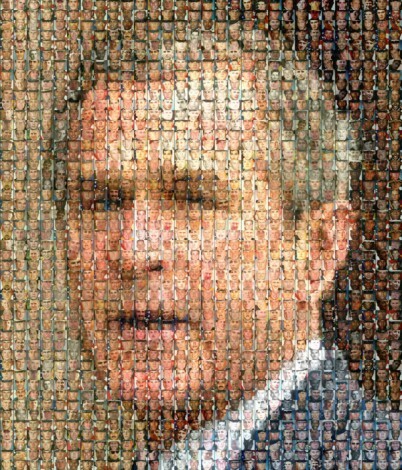 The Bush White House has been the most political ever, and has implemented sweeping changes that maximize the financial freedom of the top 1 percent while minimizing the social and political freedom of most of the rest of us, all while engaging in an optional war at immense human and financial cost. I use the word "radical" instead of conservative, because I have nothing against conservatives, and I do not consider Bush conservative in any traditional sense of the word. Even Richard Nixon's attorney, John Dean, calls the current administration "conservatives without conscience." Those of us who love this country have an obligation to protect what is left of it from these people! Almost 1,000,000 people have signed a petition to impeach the president. This is not because we do not like him; it is because he has broken his oath to uphold the constitution, and he has killed many thousands of with an optional war. Don't rely solely on the Bush-dependent media sources! Find out what is being done locally in response to the war and terrorism. This local group sponsors debates and presentations on a wide variety of relevant topics. People with opposing views are always invited to attend and participate. Supported by contributors, foundations, and government grants, NPR is a robust news organization that airs well-produced news programs from a variety of perspectives. All programs are archived and available online. Boston's NPR affiliate provides NPR news programs and locally-produced programs. At certain times of the day it provides current news from the British Broadcasting Corporation (BBC), which sometimes provides a more independent perspective. WBUR's weblog on the war is quite useful. This alternative to public radio is free of government and corporate sponsorship, and provides even more independent perspectives. Archived programs are available from the Pacifica web site; links to affiliate stations provide the ability to listen online. On October 2, 2003, the Boston Globe reported the shameful treatment of the 368th Engineering Batallion, a group of army reservists from New England. Because the Administration is keeping troops in the theater of operations much longer than originally promised (as, ahem, some of us predicted before the war), it has now decided that soldiers deserve a two-week leave for rest and relaxation. Soldiers who wish to visit their own families are expected to pay much the cost of transportation, which can amount to several months' salary for a low-ranking soldier. This situation is outrageous enough -- these troops should not be paying one dime for the costs of getting back to their families! More outrageous has been the treatment of the 368th Batallion, which was promised leave, told to buy their own plane tickets, and then told the leave was cancelled. The fiance of one of my former students was among those who has forfeited a huge airfare in this scandal. Fortunately, Sen. Edward Kennedy (D-MA) and Sen. John Sununu (R-NH) investigated and demanded compensation for this group. They did eventually get to see their families. See Pax Mundo for details. 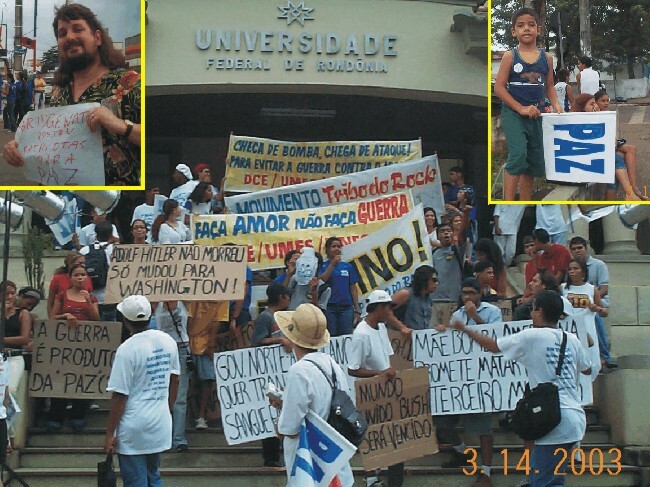 While I was in Brazil just prior to the apparent beginning of hostilities, I joined in a protest against President Bush's war on Iraq. As with many people throughout the world who oppose the looming war, the people of Porto Velho (in Rondonia, western Amazon region) are not anti-American, nor are they pro-Saddam. They just feel strongly that a lot of innocent people will be killed in pursuit of goals that could be met peacefully. I talked to a lot of Brazilians, watched television, and read the newspapers and magazines. I did not encounter any hostility toward the U.S. or its citizens, but I also did not encounter anybody who understood or supported the decision to go to war with Iraq at this time. Being in Brazil on the eve of war gave me a deeper understanding of another aspect of international opposition to the war. People in the United States are generally unaware of the fact, but we live in Rome . By this I mean that we are at the center of a world-wide empire, even though we do not usually think of it in this way. It is easy, for example, for us to forget that we have actually invaded many countries of Latin America. Most people in Latin America, however, can recite the details of U.S. interventions in Guatemala, Mexico, Dominican Republic, Colombia, Panama (we essentially created the country to get the canal built), Grenada, Cuba, and many others. For U.S. citizens, these are mere footnotes; for people in Latin America -- even our good friends such as the Brazilians -- these stories are not forgotten. Given such a history, opposition to war on Iraq arises from the fact that the war is being waged with little or no legal basis, so that many of the world's people fear it sets a precedent for future invasions. Over 800 Brazilians have already added their names to the statement about peace and justice described at the top of this page. This war is costing American lives and Iraqi lives while damaging the economies of both. Unlike World War II, this war will not provide an economic stimulus, except to very narrow sectors of the military-industrial complex (a term coined by President and General Dwight Eisenhower). U.S. families will pay about $2,000 each for this war, assuming it ends soon. Of course, some families have already paid a higher cost, in lost sons and daughters. In the Middle East, even the most pro-Western citizens, many of whom have studied and worked in the United States, are beginning to doubt their faith in our country. The costs of this loss of respect and trust are not calculable. Most U.S. citizens do not follow international politics closely enough to realize that the current war in Iraq could be just the first in a series of such wars. In September 2002, the administration issued a revised National Security Strategy , which put the world on notice that the United States would wage war not only in response to attack, but also to prevent possible future attacks. This policy -- which has absolutely no basis in international law -- is the pretext for the war on Iraq. It could just as easily apply to Syria, Iran, Libya, or North Korea. The WBUR program On Point addresses the question of whether Syria is the next target . Note: Since posting the above in September 2002, it has become evident that Syria will not be next. Following the aministration's "trial balloon," the tide of public opinion -- in the U.S. and internationally -- turned against further adventures. Follow these links for some more alternative points of view about the rush to war . Meanwhile, consider the message behind each of the following visual satires (a.k.a. political cartoons). 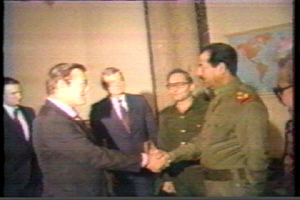 Why is our opposition to Saddam absolute, when we are willing to overlook the faults of other regimes? History matters. If we do not want to fight dictators, we should quit supporting and creating them. This graphic may be considered too cynical. After all, issues other than oil are at stake. The dependence on imported oil cannot be ignored as a factor, however, especially when both the president and the vice president who are waging this war have been oil-company executives. The U.S. Tilts toward Iraq, 1980-1984 "
This site does not argue that oil was the only reason for the Iraq attack, but it does present evidence that it was a significant part of the equation. How could it not be? Return to James Hayes-Bohanan's September 11 page . Return to James Hayes-Bohanan's Environmental Geography page .